Shri-mahadevi is a female Buddhist divinity with Hindu origins. In Hinduism, she is Lakshmi, a goddess associated with good fortune and the wife of Vishnu, one of Hinduism’s three principal gods. Chinese Buddhists, however, transformed her into a deva, a supernatural being that has extreme longevity but remains outside the realm of enlightenment and attempts to assist believers on the path toward salvation. Married to Vaishravana-deva, Guardian of the North, Shri-mahadevi likewise is associated with protection of the north, which was believed to be a dangerous direction inhabited by demons and other evils. 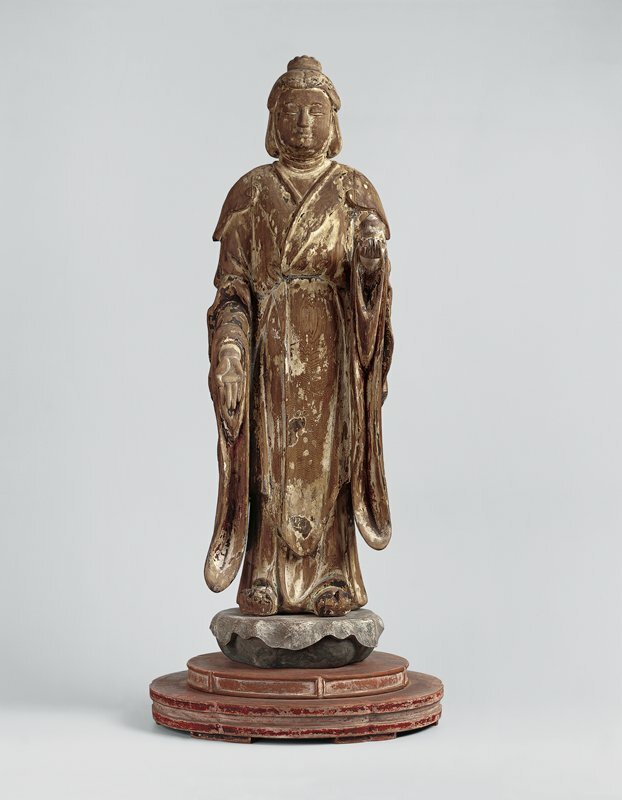 In this Japanese sculpture, she wears a robe that was once brightly colored with floral patterns—clothing common among women in China’s Tang dynasty (618–907), a nod to her Chinese roots.